I'll talk a little about the historical form of my blade now. It's a seax, a single-edged war knife carried by any and all free men the Germanic migration period. In some ways, it's really a symbol of that time and place: it represents the danger faced by the tribes who struck outward from their swampy homelands, the self-sufficiency and craftsmanship they were capable of, the fact that they knew what it would take to take what they wanted, and the fact that the power of freedom and personal choice were the utmost values of their society, at the possible cost of violence, and all with cold functionality and artistic flourish. 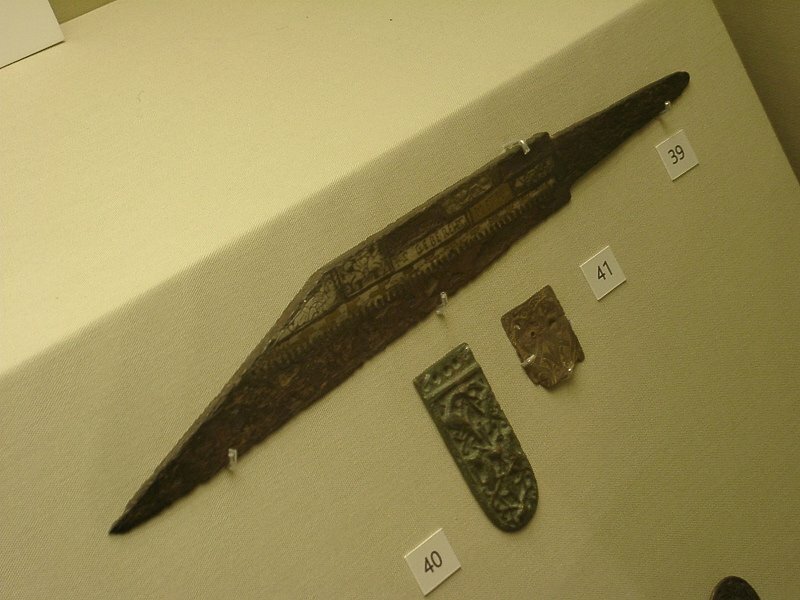 The seax, as I spell here with the Anglo-Saxon spelling, refers to the particular weapon carried by men of the Angle and Saxon tribes of northwestern Germany, who migrated en masse to the British Isles in the 5th and 6th centuries AD. "Saxon" itself is most likely a reference to the weapon (more generally spelled "sax" in reference to the Scandinavian and Continental flavors as well, and is the modern German spelling). 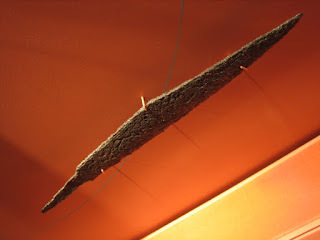 A characteristic style of the Anglo-Saxon model is the "broken-back" design: thick spine, flattish grind, long and nasty point with a triangular cross-section, and almost axe-like cutting power, but with all the deadly "handleability" of a sword. In many ways, the sax represents to informed bladesmiths today an historical sandbox of blade design and metallurgical techniques: there are so few parameters to what a sax is and such a grand and exciting variety of blade sizes, geometries, metallurgical compositions, patter-welding techniques (almost endless! ), finishes, and beyond. Therefore, a context-minded smith has great freedom in his design and boundless inspiration to choose from. Some of my favorite museum pieces of saxes. It's hard to see at this point, but the blade's underlying pattern is visible in this polished state. It's really just a matter of moving it around in the light, and a subtle difference can be discerned. Some have argued that historical pattern-welded blades were finished like this and left as they were, with a polished finish and a very subtle revelation of pattern. Once again, the differences in the steels' chemical composition is responsible for the dramatic contrast in the etch. 1080 is a simple steel, meaning it is almost completely composed of iron and carbon (about 0.8% carbon, pretty high), which here has etched dark. The lighter one is 15n20, a similar steel but with a 0.2% proportion of nickel, lending it brightness. These are both relatively simple steels that forge-weld well and behave similarly in heat-treatment, giving them good compatibility. It's clear that the back bar is twisted more tightly than the middle, and has not been ground into as far. The further you grind into a twisted bar, the closer you get to the star-pattern you see in the middle bar. The outside of the twist looks like the diagonal lines of the back bar. The spine itself shows something of a gradient, from star to stripes, to show the different depths of my grind into the twisted bar. There are incredible possibilities with pattern-welded steel, and I'm just beginning to explore them! Good to see a thick spine like on the old ones I've seen to too many smith's and companies make them to thin. Great job well done. Aaron Woods.